When I tried to find a good pattern for more frozen dolls, I discovered the best patterns had been sold to a company and were no longer available for free. 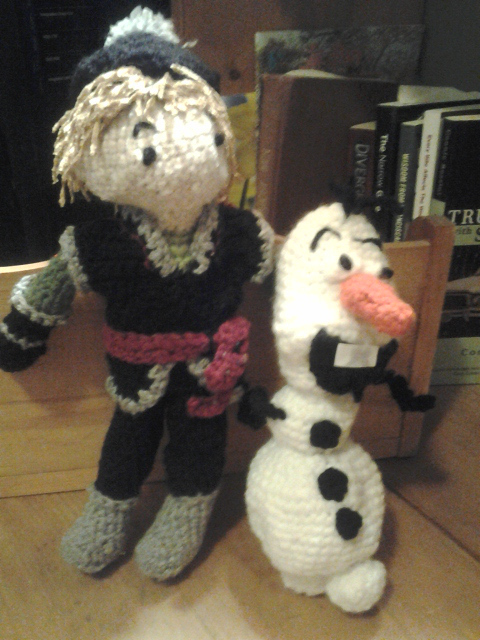 I Had already crocheted a wonderful Kristoff, Olaf but only HALF of Princess Anna. 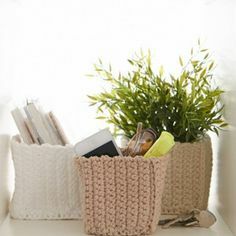 As I looked for other alternative patterns for princess Elsa, I was disappointed. So I crocheted a dol l following a basic doll pattern and then did my own Elsa. She turned out perfect, not too slinky, not too weird looking, just an appealing doll for a four-year-old. 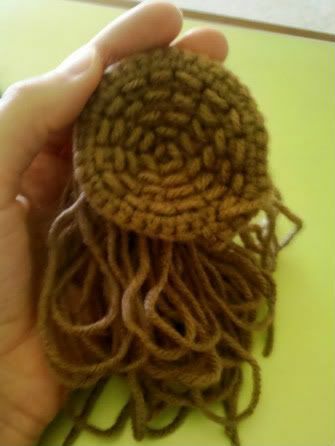 I crocheted a blond hat, a wig and attached it to the dolls head before adding long strands of yarn for the braid. This base wig prevents any gaps showing if the long strands of hair separate. The bodice of the dress and the arms are simply the body of the doll crocheted in blue. I crocheted two rows on top afterward and attached a cape to make the dol seem as if she really has a dress on. The skirt is attached to the waist after the doll is finished. I crocheted a white lace crown using thin cotton thread and a size 2,7 hook but had to add thicker blue wool behind so the crown would show up.